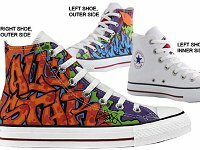 Photo gallery of the white graffiti high top chuck featuring unique graphic print uppers. 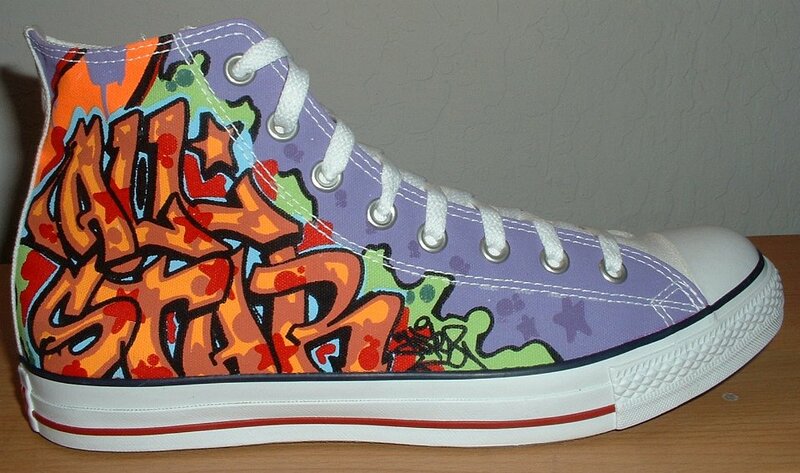 1 White Graffiti High Top Chucks Outside view of a left white graffiti high top. 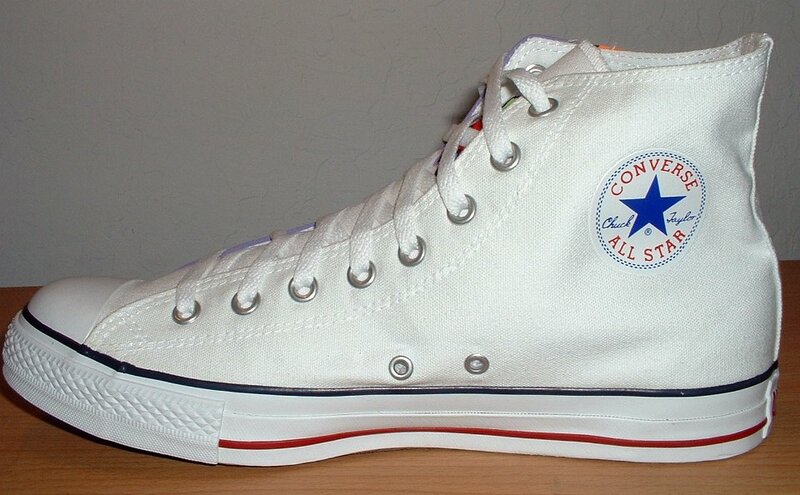 2 White Graffiti High Top Chucks Inside patch view of a left white graffiti high top. 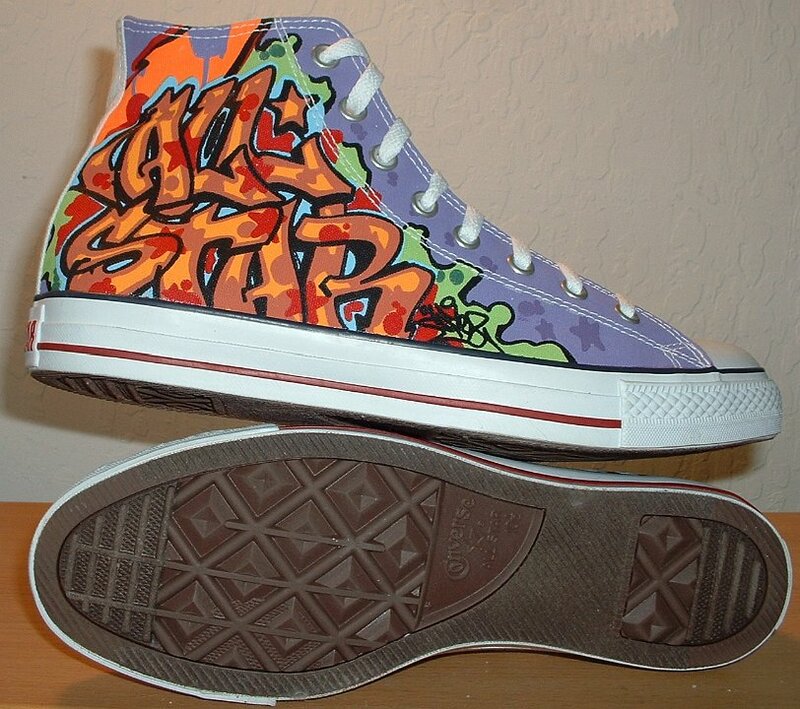 3 White Graffiti High Top Chucks Outside view of a right white graffiti high top. 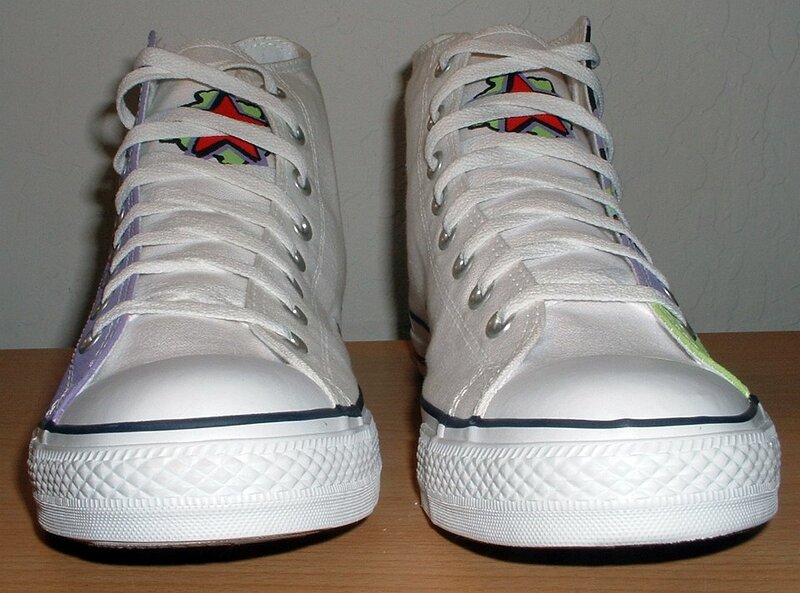 4 White Graffiti High Top Chucks Inside patch view of a right white graffiti high top. 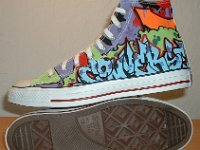 5 White Graffiti High Top Chucks Front view of white graffiti high tops. 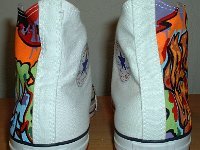 6 White Graffiti High Top Chucks Rear view of white graffiti high tops. 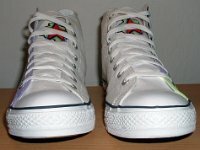 7 White Graffiti High Top Chucks Closeup of the tongue of a white graffiti high top. 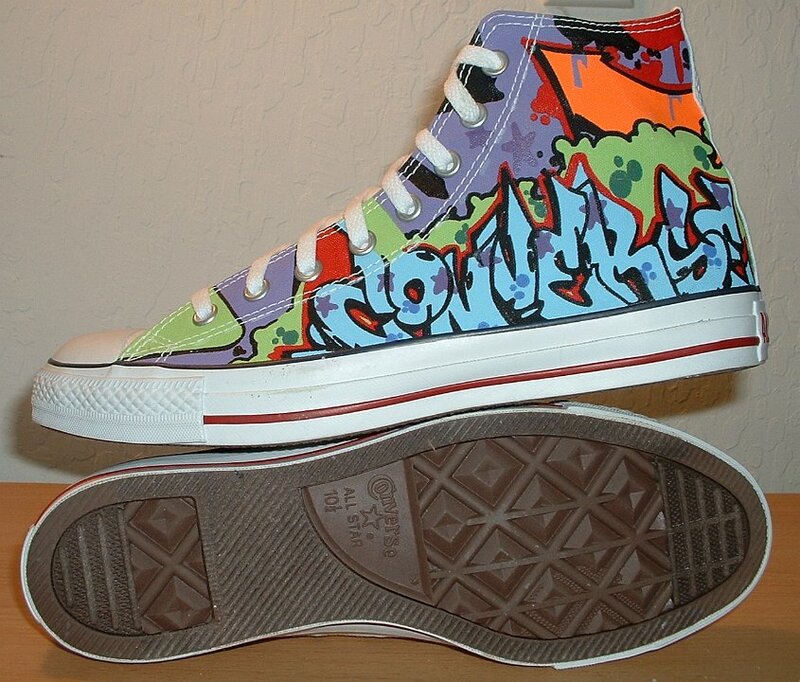 8 White Graffiti High Top Chucks Top view of white graffiti high tops. 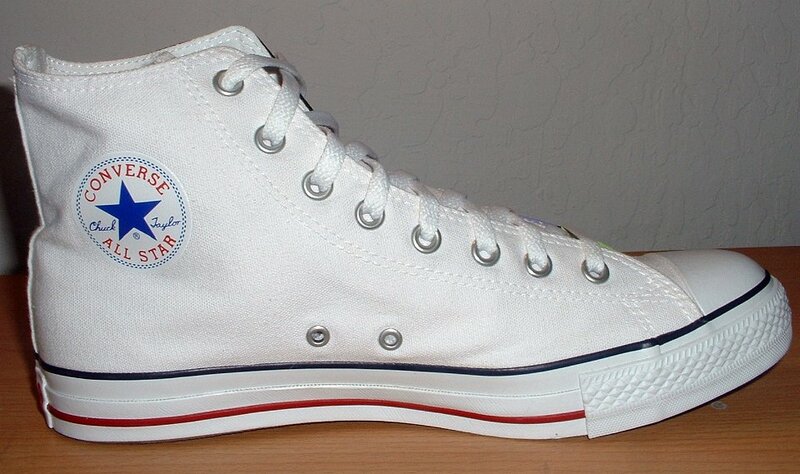 10 White Graffiti High Top Chucks Right outside and sole views of white graffiti high tops. 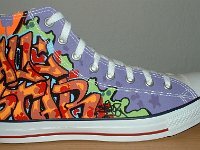 11 White Graffiti High Top Chucks Outside views of white graffiti high tops. 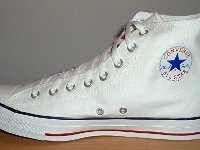 12 White Graffiti High Top Chucks Inside patch views of white graffiti high tops. 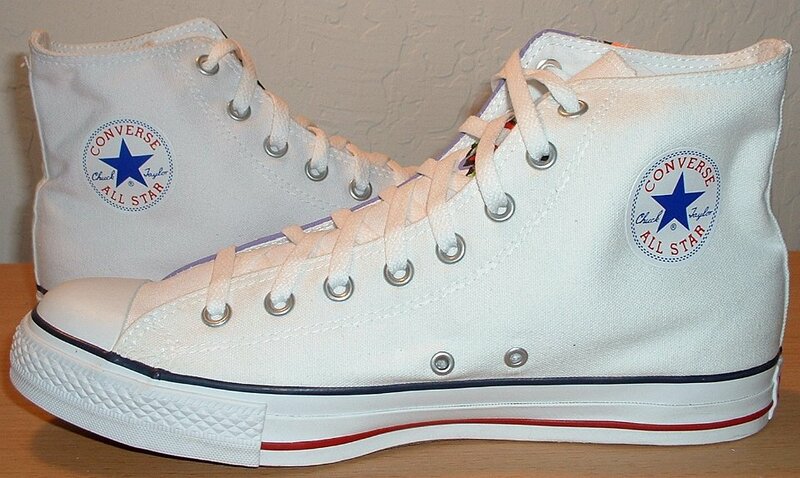 13 White Graffiti High Top Chucks Angled front view of white graffiti high tops. 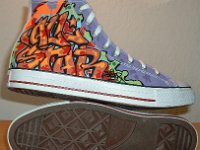 14 White Graffiti High Top Chucks Catalog views of white graffiti high tops. 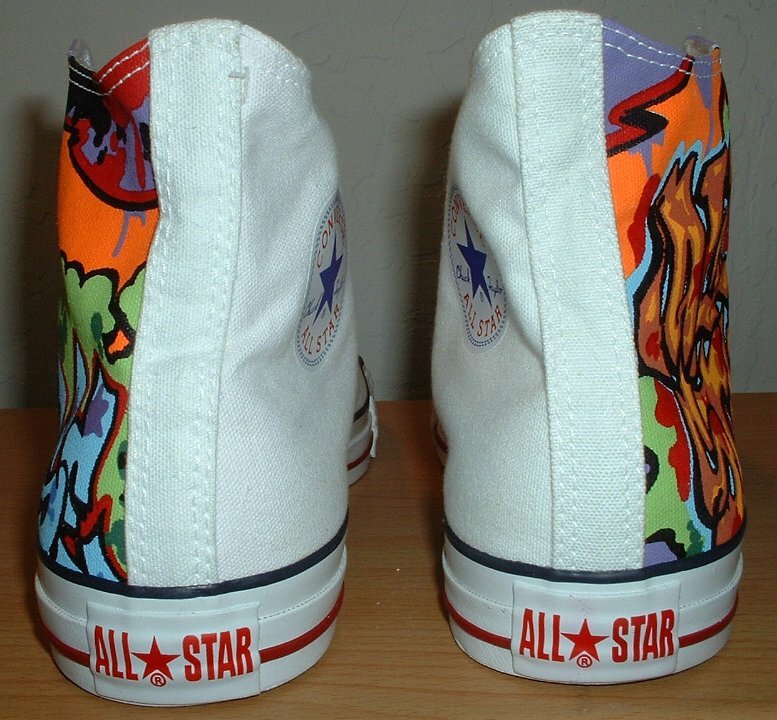 15 White Graffiti High Top Chucks Rear view of left white graffiti high top. 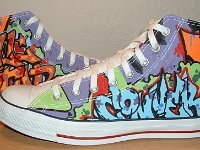 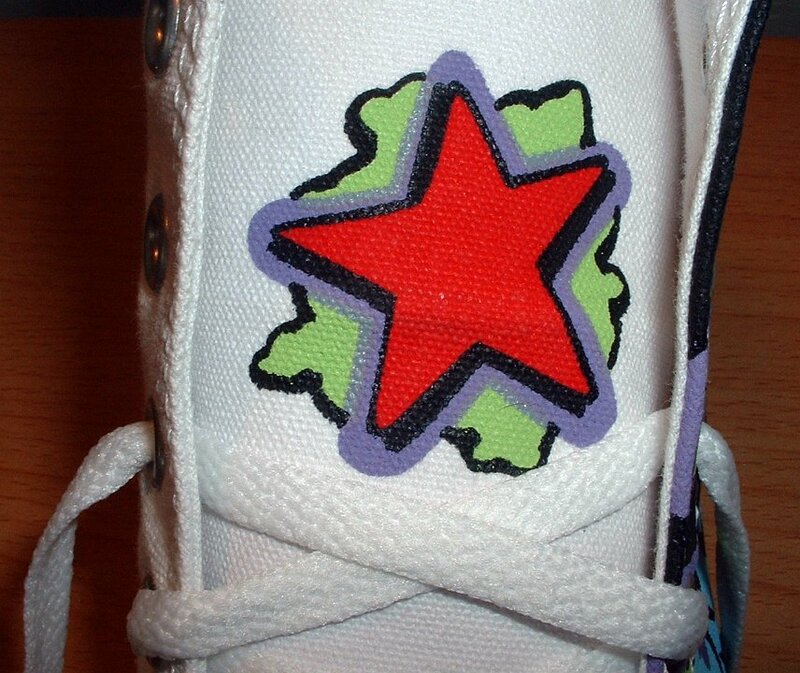 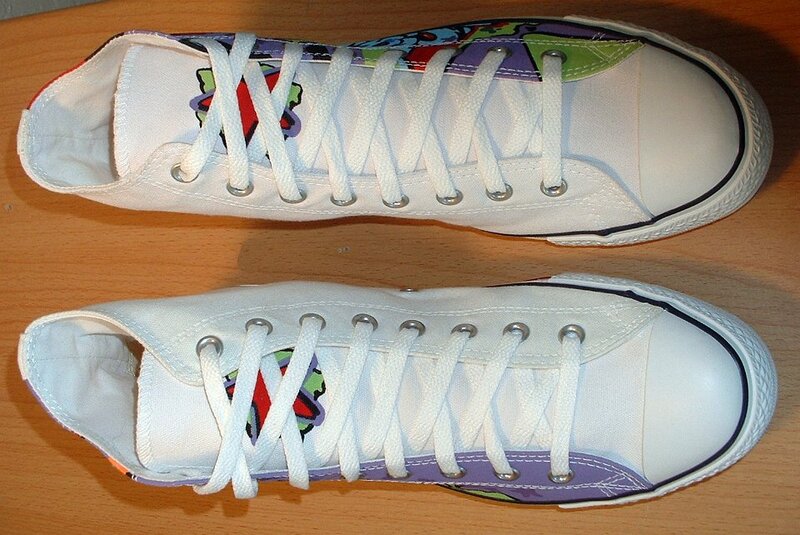 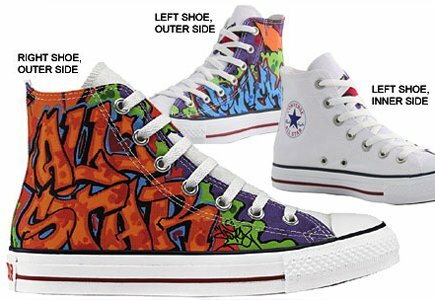 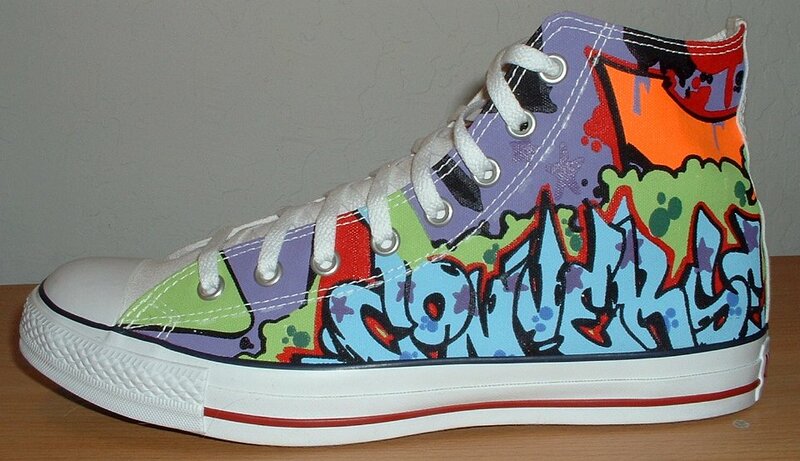 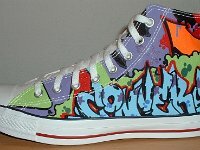 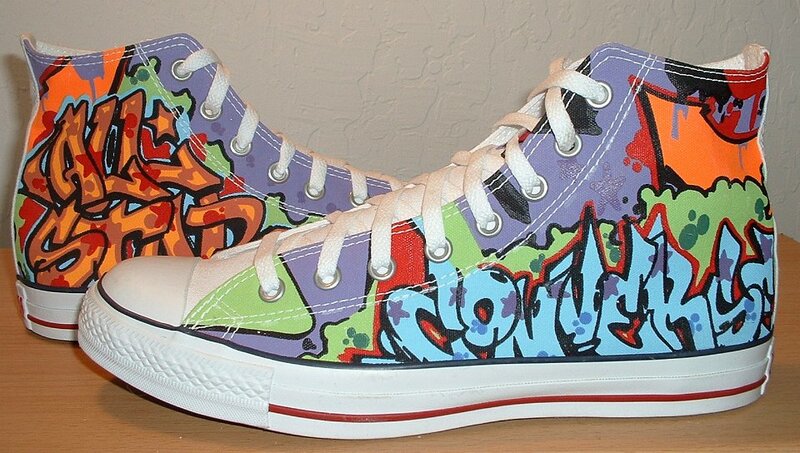 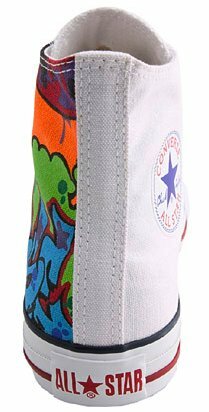 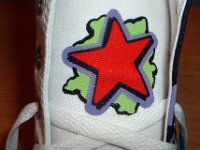 White graffiti high top chucks feature special graphic prints on the outsides of each shoe, and on the tongues. 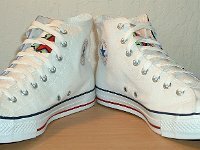 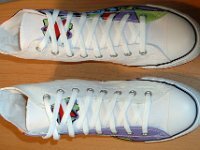 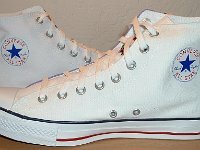 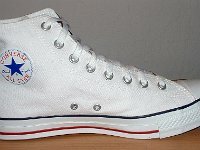 The basic shoe is an optical white high top with blue and red trim.